To people of a certain age, the post-punk years of 1979-81 saw some of the finest ever music emerge from the embers of punk, but whilst some bands – Joy Division, Teardrop Explodes, and Echo & the Bunnymen - had hits and became household names, for others…well, it just wasn’t meant to be. 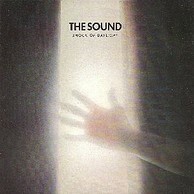 The Sound belong in the latter category and are living proof that it’s not just in these sanitised post-Fame Academy/Pop Idol days that you need an image, because whilst Ian Curtis had his epileptic-like dancing, Julian Cope that flying jacket and Ian McCulloch his hair, lips and boasting, The Sound’s singer/songwriter/guitarist Adrian Borland was some ordinary looking bloke with a slight weight problem who’d have looked ridiculous in a pair of jodhpur’s. And whilst it is extremely unlikely that he would have unbuttoned his shirt on TOTP in the first place, it’s fair to say that the little girls wouldn’t have screamed like they did when Mac went pop - and for better or worse, these are the things that get you the front covers, whether it be Smash Hits or the NME. The Sound, meanwhile, with Borland resembling a brickie in black, were - possibly as much as any other band I can think of - just about the music. But what music! I first heard The Sound in back in 1980, when a mate played their classic Heyday 7” single. I was blown away – it was like that Liverpool sound I was so in love with, but with the power and adrenaline of ’77. It was, at the risk of sounding glib, the Pistols on Zoo Records! Consequently, the rest of the debut album, Jeopardy, initially sounded like a disappointment as a result, but that feeling didn’t stay long. Sure there was little else with that sense of fury (though Missiles had its moments! ), but it was a template for what was to come – hooklines, heart and soul, a combination that truly came to fruition on it’s follow-up, From The Lion’s Mouth, generally considered to be The Sound’s finest achievement. But following one further album, All Fall Down, which inspired less favourable reviews, The Sound seemed to disappear completely. They eventually re-surfaced in early ’84 with this six track mini album, Shock Of Daylight, by which time things had changed. Of their contemporaries, the Teardrops had, as the headline writers used to delight in saying, ‘imploded’, the Bunnymen had become victims of style over content and with Curtis now long gone, New Order had ceased being miserable JD copyists and discovered Arthur Baker, whilst another of their contemporaries, U2, had discovered white flags and reverence and were on their way to becoming the biggest band in the desert. I mean world. And then there were those new kids on the block with a lead singer who was Bono with gladioli. And wit. There had also been changes closer to home. The Sound had left the major label subsidiary, Korova, and signed with the altogether smaller Statik, but if you thought they were going to return with an apologetic whimper, then you couldn’t have been more wrong. On hearing Shock of Daylight nowadays, the one word that repeatedly springs to mind is defiance. It opens with the blistering Golden Soldiers, a song that oozes sincerity and, yes defiance, with its heartfelt "I could go to war for you". In fact, Borland sounds so strong and self-assured on Golden Soldiers that, with the benefit of hindsight, it makes his ultimate giving in all the harder to take. On closer listening, you can hear that Golden Soldiers is just a great 'song' - for all it's blistering guitars and fab basslines, you know you could strip it down to just an acoustic and vocals and it would sound like one of the greatest Unplugged tracks ever. There's other great moments here – Longest Days is a beautifully realised track with a searing guitar and excellent crisp, clipped bassline c/o Graham Bailey. There’s also some great keyboards on this track, be it the simulated brass punches that accompany the intro or the drop dead gorgeous woodwind like effect that complements lines like “Hope was the worst thing I could get from anyone”. Counting The Days follows, and although not necessarily one of the albums highlights, it is the type of mid-paced track that The Sound did so well – elevated in this case by a nice use of double tracked vocals. I've always loved the altogether quieter Winter, however, with its simple acoustic riff, and Borland’s vocals, always heartfelt, are especially moving on this track. And its "At least let me sleep through the winter" line has taken on a rather poignant meaning post-suicide. The best is still to come, however - "A New Way Of Life" is surely one of The Sounds best ever songs. “Light a candle to see me through these times” and “I am wary of the unknown“, sings Borland in the verses before sounding altogether more optimistic when the chorus arrives and he sings “A new way of life takes me away from you”. And there’s a truly superb section when the guitar drops out as Borland paints his picture over a quieter backdrop before a searing – and, bizarrely, optimistic sounding - guitar solo comes in from nowhere. Shock of Daylight closes with Dreams Then Plans, a track that sounds better than ever with one of those chord sequences that brings me out in shivers. Borland again appears to be in turmoil, one minute singing “Where the days are numbered, count me in”, before looking forward as he once again sings about “a new kind of life”. The track appears to be almost fading away until he surprises us with a big, if brief, finale. At the risk of playing amateur psychiatrist, it’s almost as if he’s convincing himself that he’s trying to look ahead as he drifts on and on and then decides to end it all. Quickly. New listeners could argue that some of the keyboards date it (and this goes for the otherwise excellent BBC Recordings that saw the light a couple of years ago, too) as they’re very much a product of the 80's, but otherwise this could have been made anytime - for which producer Pat Collier definitely deserves a pat on the back. Ultimately, Shock of Daylight is timeless music made by a man who wrote some of my favourite lyrics, which, although often despondent, lost and weary, somehow never sounded self-pitying. And although this LP isn't perhaps the greatest showcase for his guitar playing, Borland also came up with some of the best riffs to emanate from a six string. (Stooges fans might want to investigate Fire from Lion’s Mouth!). After this mini-LP came the full length Heads & Hearts, an album that – the odd track like the excellent Temperature Drop aside - disappointed me at the time, but which sounds excellent these days. But, after one more studio album, Thunder Up, Borland closed the door on his band and went it alone before giving up completely back in 1999 when, following alleged mental health problems, he ended his life when he stood in front of a train. Death, as hinted in what I’ve written here, makes you view someone’s work differently, particularly when the person involved has ended it himself. It’s easy to take a single line and try and turn it into a major clue as to what was to come, when it no doubt meant something differently entirely at the time of writing. And it’s easy for the death disciples to jump upon the dead rock star bandwagon and turn them into some kind of rock and roll romantic hero, though even in death Borland’s lack of image will surely count against him compared with, say, Nick Drake and his long flowing locks and photogenic innocence – being honest, I doubt whether Borland will experience the same slow, steady rise in sales over the next 25 years that Tanworth-in-Arden’s favourite has. But I’m too old for all that teenage angst and death thing now. When I hear The Sound these days, it saddens me that he’s gone, but nothing detracts from Borland’s brilliant grasp of melody, heartfelt lyrics and beautifully emotive singing. He mightn’t have waved a white flag Bono-style, and - even though he made albums that would piss all over Ocean Rain - neither did he boast that he'd just made the greatest album ever made. He just got on with the music. And even though albums like Jeopardy, From The Lions Mouth and this virtually forgotten classic deserve, no DEMAND, a bigger audience, sadly, the music just isn’t enough for some people .